1990 - Daisenpu is released for the Mega Drive in Japan. 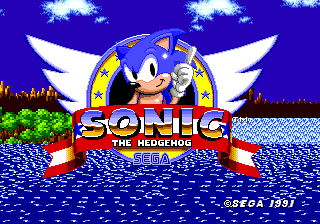 1991 - Sonic the Hedgehog is released for the Mega Drive in North America and Europe. 1994 - Summer CES 1994 begins. 1995 - The Sega Saturn Denshi Book Operator, Photo CD Operator and Video CD Card are released in Japan. Blue Seed: Kushinada Hirokuden and Digital Pinball: Last Gladiators are released for the Sega Saturn in Japan, while CGMV Virtua Fighter 2 is released on Video CD. 2000 - Fur Fighters, Marvel vs. Capcom: Clash of Super Heroes and Silver are released for the Dreamcast in Europe. Sega Archives from USA Vol. 1 is released for Windows PCs in Japan. 2001 - Sonic Adventure 2 is released for the Dreamcast. Phantasy Star Online Ver. 2 Perfect Guide is published in Japan. 2004 - Phantasy Star Online Episode I & II Premium Arrange is released in Japan. 2005 - Kouchuu Ouja Mushiking: Greatest Champion e no Michi is released in Japan for the Game Boy Advance. 2006 - OutRun 2006: Coast 2 Coast is released for Windows PCs in North America. Tenchu: Time of the Assassins is released for the PlayStation Portable in Europe. 2008 - Alex Kidd in Miracle World is added to the Wii's Virtual Console service in North America. 2009 - The Conduit is published for the Wii in North America, while the System 16 version of Golden Axe hits the system's Virtual Console service in Japan. 2011 - Sonic & Sega All-Stars Racing is released for iOS in North America. 2014 - Company of Heroes 2: The Western Front Armies is released for Windows PCs in North America. 2016 - Hatsune Miku: Project DIVA Arcade Future Tone is released for the PlayStation 4 in Japan. The Nintendo 3DS version of Mario & Sonic at the Rio 2016 Olympic Games is released in South Korea.